It used to be that if you wanted a thin-and-light laptop with an awesome keyboard and great battery, then than meant you were focusing in on one specific machine. Apple’s MacBook Air. But those days are long gone. Today, you have a mind-numbing selection of options, especially in the 13-inch class where the MacBook Air plays. It received an update in 2018 that made it significantly more modern, but does it still have what it takes to beat out stunning new 2-in-1s like the HP Spectre x360 13? The revised MacBook Air is familiar, yet far more modern than its predecessor. Its chassis is thinner, lighter, and sports smaller bezels, making it look more like it belongs in 2019 instead of 2012. It’s just as elegant and conservatively attractive, coming in Gold, Silver, and Space Gray colors. The 2019 Spectre x360 doubles down on its previous version’s angular lines, in a “gem cut” iteration that has angles everywhere catching the light. You can get it in Dark Ash Silver or Poseidon Blue, and either way, it’s a look that stands out. Both laptops are solidly built, sporting all-aluminum chassis that are rigid and suffer little flexing or bending. The MacBook Air is thicker than the Spectre x360 at 0.61 inches versus 0.57 inches, but it’s lighter at 2.75 pounds versus 2.92 pounds. Input matters as well. The MacBook Air equips Apple’s 3rd-generation butterfly keyboard with its extremely shallow keys and very clicky mechanism, while the Spectre x360 has the keyboard we prefer. It’s precise and responsive, with far more travel and a more comfortable feel. At the same time, the MacBook Air benefits from the line’s large Force Touch touchpad, while the Spectre x360’s touchpad is smaller and uses less precise Synaptic drivers. The tie-breaker is the HP’s touch display supports an active pen for Windows 10 ink support, which the Air lacks. Connectivity is also a point of divergence. The MacBook Air doubles down, literally, on USB-C with Thunderbolt 3, offering two of those ports and nothing else. 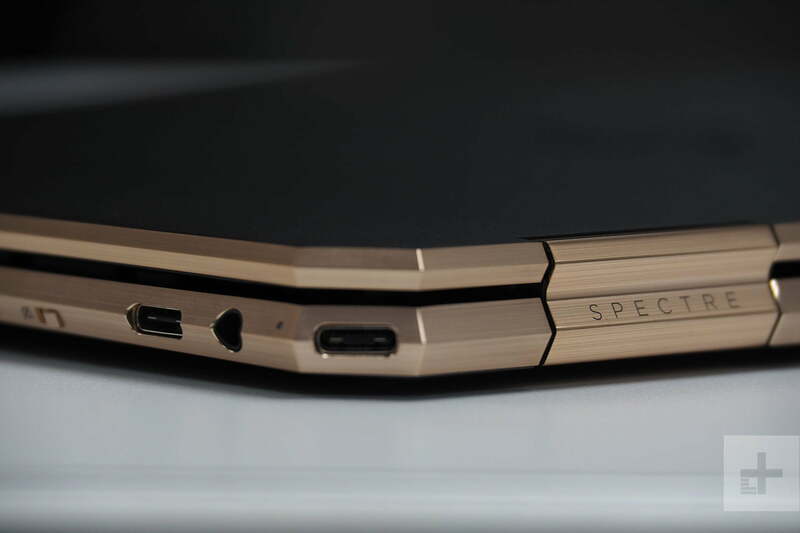 The Spectre x360 also has two USB-C ports with Thunderbolt 3, but it also supports legacy devices with a USB-A 3.1 port, and it has a microSD card reader for creative types. It’s all the benefits of Thunderbolt 3 without the inconvenience of needing dongles for older peripherals. The MacBook Air uses Intel’s low-power Y-series dual-core CPUs, meaning it focuses on saving power and reducing heat. The Spectre x360, on the other hand, is built around the absolute latest Whiskey Lake Intel 8th-generation CPUs. These quad-core processors give the Spectre x360 much faster performance and make it able to handle more demanding productivity and content creation tasks. You’ll need to jump up to the MacBook Pro to find a worthy opponent. 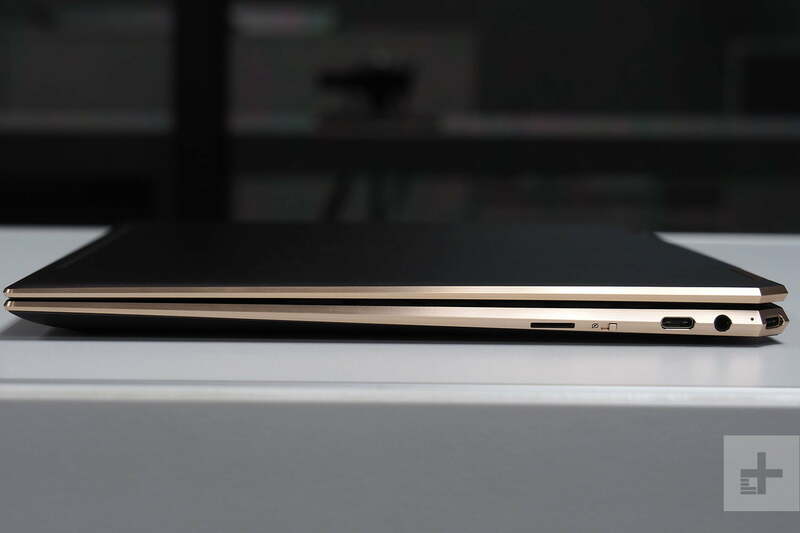 The MacBook Air’s PCIe solid-state drive (SSD) is faster than the one fueling the Spectre x360. That doesn’t mean that the HP is slow at accessing and saving data, but this is the one performance metric that’s in Apple’s favor. Typically, MacBooks offer the best displays, with the widest and most accurate colors, the highest contrast, the most brightness. Unfortunately, the MacBook Air is an outlier here, with merely average display performance provided by its “Retina” 2,560 x 1,600 resolution panel. The Spectre x360’s Full HD display is roughly equal in terms of colors and brightness, but it offers a much higher contrast ratio. At the same time, HP built in Intel’s new 1-watt screen, which uses about half the power of the typical display. Also, the Spectre x360 can be configured with a 4K option for extreme sharpness and HP’s SureView privacy screen option is also available. You won’t notice either of these laptops in your backpack. They’re equally portable, and therefore a great option for anyone whose work isn’t anchored in one place. However, size and weight are only two portability considerations. Battery life also matters, and here the Spectre x360 is a standout performer. It lasted for 17.5 hours compared to the MacBook Air’s roughly 10 hours in our local video test, and 12.5 hours in our web browsing test compared to the MacBook Air’s just over eight hours. The HP even lasted an hour longer when running our CPU-intensive Basemark test, at four and a half hourse, in spite of the MacBook Air’s more power-efficient CPU. The Spectre x360 is one of the longest-lasting laptops we’ve ever tested, and that makes the more meaningfully portable laptop. The MacBook Air has an entry-level price of $1,000, though that’s not the 2018 version. The model used for this comparison starts at $1,200, which comes with 8GB of RAM and a 128GB SSD — and really, that’s the only one you should be consider purchasing. The HP Spectre x360 starts at a slightly higher price, though it’s difficult to compare the two apples-to-apples. It’s $1,350 for a Core i5, 8GB of RAM, and a 256GB SSD, and it tops out at $2,240 with a Core i7, 16GB of RAM, a 2TB SSD, and a 4K display. You’ll have to jump up to the more expensive MacBook Pro if you want competitive components. Mac fans will no doubt prefer the look and feel of the Air. But if you’re a bit more agnostic, there’s really no reason to settle for it. The Spectre x360 more powerful, longer-lasting, and has 2-in-1 functionality. It wins on nearly every level.